The Midi Skip is ideal for Household, Garden and DIY projects. This Skip can hold roughly 40 refuse bags and can fit in 99% of driveways. The midi skip can hold between 30 and 40 black bags making it the ideal choice for kitchen or bathroom refits. Furthermore, it is the perfect choice for small jobs that don’t require a standard sized skip. It’s also great for those who are short on space because it will easily fit any driveway. It doesn’t take up too much space either. We recommend the midi skip for all those in between jobs because it’s small and compact. You can use it to get rid of household waste if you’re having a clearout, or to dispose of your old bathroom suite if you’re remodeling. Putting in a new kitchen? The midi is perfect for getting rid of those old kitchen units too. 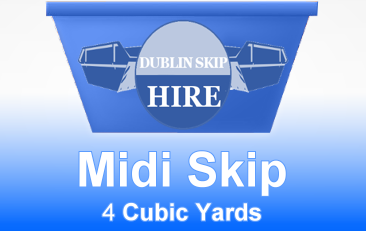 The midi skip is 4 cubic yards. It is one of the most conveniently sized skips in our product category. If you feel this skip is the right size for your upcoming project, be sure to get in touch with our office or use the order button on this page. One of our trained staff will be in touch to organise the delivery date and time to suit your needs. We pride ourselves on offering the cheapest skip hire rates in Dublin. Our staff are always on hand to help with any questions and queries you may have.